So, what is cross training? If your main focus is on just one sport and you do most of your training specific to that sport, then cross training is simply substituting any other discipline for some of your training sessions. For example, for runners, if you run 3-4 times a week and maybe race at weekends, then dropping one of your running sessions in favour of, say, a bike ride or a weights session at the gym would count as cross training. Focussing on just one activity can overdevelop some muscles specific to that activity, but leave other muscles underdeveloped and the whole body out of balance. This can lead to inflexibility and, worse, injury. So, how to cross train? From a runners perspective, substitute any activity that isn't running, but still gives your body a good workout. If it gets your heart rate up and works some non-running muscles then its cross training. Common ways to get started are to add some weight training, swimming or cycling once a week. Rowing machines such as the Concept 2, found in many gyms, are excellent. Also useful are the "ski machines" found in most gyms, that work the arms and legs at the same time and, like swimming, often a good non weight bearing workout. I'm not so keen on them because of the restricted range of motion, except for short warm-ups. 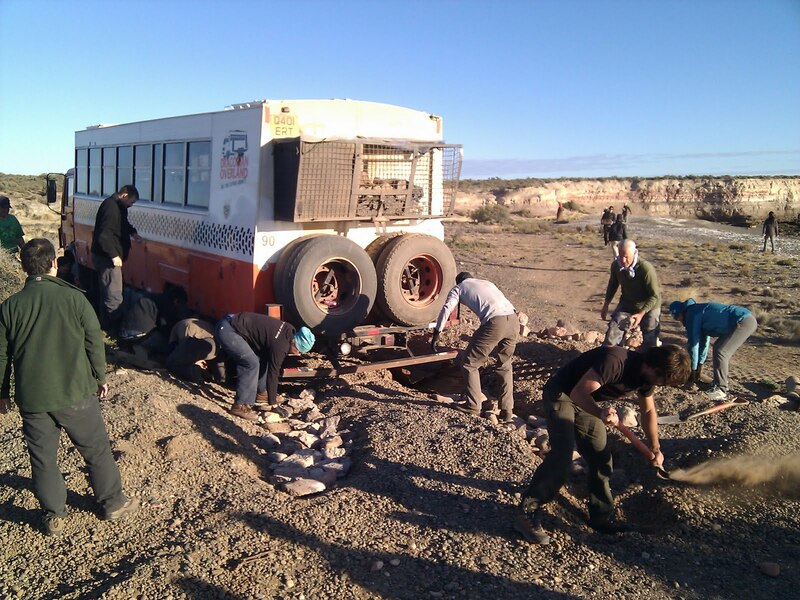 I try and exercise outdoors wherever possible, and here is one example from a recent Dragoman Overland trip across Argentina, where the driver got the truck got stuck in loose gravel. It took the group an entire morning of digging and shovelling gravel, then laying heavy steel sand tracks and rocks in the two channels we dug, in order to provide a solid surface to have the truck towed out. All in bright sunshine and crisp, cold air, on the edge of an Argentinian beach. A beautiful location. Much better than an hour in the gym and it worked a lot more muscles! Don't overdo the running. Remember that training breaks your body down. Rest repairs and strengthens your body. Stronger muscles will help to improve your running performance and reduce the likelihood of injury. Let's hear unusual examples of how you cross train in the comments.